Urban deserts. Suburban deserts. Even in rural areas it is difficult to escape the commercially refined silicates of mechanized and meaningless modernity that blow over and bury the fossilized remains of dead gods and old ways. The desert — The Nothing — grows and obscures and stifles all. Jünger’s forest is a spiritual oasis. It is not in the desert, but within it. The forest is everywhere — in the desert, in the bush, and in the enemy’s’ own backcountry — like an invisible layer of transcendent humanity and creative life energy that is seen only by those who choose to see it.
. . . it is essential to know that every man is immortal and that there is eternal life in him, an unexplored and yet inhabited land, which, though he himself may deny its existence, no timely power can take from him. He doesn’t reference it directly, but one wonders if the forest is some kind of allusion to the Garden of Eden — some memory of pure, sinless and untainted man living in harmony with nature. Throughout the book, Jünger seems to be equating pure, primal human morality with Christ-like morality — which will seem an obvious error to everyone who is not a Christian, and a natural fact to anyone who is. The forest rebel — one who takes the forest passage — is so morally certain that, “he allows no superior power to dictate the law to him, neither through propaganda nor force.” This is somewhat problematic, because this kind of individualism-at-all-costs makes tribal life impossible, and therefore makes a new, better society impossible. Without hope for a better society and the ability to integrate into it and trust one’s peers, the forest rebel is just raging against the machine, and seems like a mere contrarian or malcontent. 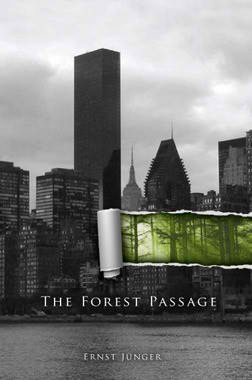 The Christian morality of The Forest Passage is an integral part of it, but Jünger’s conception of it is so amorphous that it often seems Jungian or similar to the work of Joseph Campbell — it’s as if he’s superimposing Christian morality on all myths. If we use the forest as a code for the timeless world of myth that exists in us, and choose to perceive it as being alive in something as cold and dead as shopping mall parking lot or a government building, we can experience life differently. In a recent interview I did with Paul Waggener from the Wolves of Vinland, he said that Germanic mysticism was his life, and that the aim of ritual was to plant a seed that spreads out like the branches of a tree and affects every aspect of one’s life, until everything becomes ritual. One could say that a man who achieves this state of being is living in the forest, despite the desert. In old Iceland, Jünger wrote, “A forest passage followed a banishment; through this action a man declared his will to self-affirmation from his own resources.” A man on the forest passage “‘takes the banishment in stride” and becomes his own warrior, physician, judge and priest. Jünger warned forest rebels away from the controlled, predictable and pointless forms of rebellion, like voting “no,” and offered that a man scrawling “no” on a wall would have a greater impact on the minds of those around him. Spreading dissenting and destructive ideas and information can have a greater impact than making an official gesture that can be easily tracked, quantified and punished. One can never know the true motives for the sniping of anonymous online characters today, and it is difficult to gauge their sincerity because they are ultimately accountable only to themselves and can easily change positions or be complete hypocrites. However, it is possible and likely that some are truly sincere and have chosen the forest passage because it allows them to do greater harm to the desert forces. Those who fund the operations of more public figures and organizations are also examples, as they must remain covert to continue to generate the income that they funnel into insurgent operations.
. . . conducts his little war along the railway tracks and supply routes, he threatens bridges, communication lines, and depots. His presence wears on the enemy’s resources, forces them to multiply their posts. The forest rebel takes care of reconnaissance, sabotage, dissemination of information in the population. None of us can know today if tomorrow morning we will not be counted as part of a group considered outside the law. In that moment the civilized veneer of life changes, as the state props of well-being disappear and are transformed into omens of destruction. The luxury liner becomes a battleship, or the black jolly roger and the red executioner’s flag are hoisted on it. This is one of the great strengths of The Forest Passage, and a good reason to read and contemplate it. Any of us could be forced into a position — such as prison — where solitary and spiritual revolt is the only form of revolt left available to us. Understanding the nature of power and the nature of the modern bureaucratic systems means understanding that you will receive no justice from the system, and that you may find yourself completely alone. The resistance of the forest rebel is absolute: he knows no neutrality, no pardon, no fortress confinement. He does not expect the enemy to listen to arguments, let alone act chivalrously. He knows that the death penalty will not be waived for him. The forest rebel comes to learn a new solitude . . .
Like any prisoner of war who knows he will not be rescued, he is ultimately alone with his honor. However useful, this focus on solitude and the absolute moral authority of the individual requires some sort of caveat. This kind of alienation and absolute individualism limits human connections and makes human relationships disposable. It is a product of and the way of the desert. It is the way of the inveterate consumer who chooses one identity today and another tomorrow, fearful of the risks associated with true commitment to other people. The forest passage is a strategy for desperate and fearful times. It is a tool for the prisoner, whether behind bars, or behind a desk typing with a camera over his shoulder and some algorithmic authoritarian tagging and monitoring his keystrokes. Any vision of a forest worth preserving must include a reconnection not only with myth, but with men. The end must be to find a tribe among the trees, or the forest itself, however magical, will forever be a lonely and fearful place, and it will offer little comfort from the encroaching desert. Published: June 30, 2014 | This entry was posted in North American New Right and tagged anarchism, book reviews, Christianity, Ernst Junger, individualism, Jack Donovan, myth, North Amerian New Right, originals, The Forest Passage, tribalism. Both comments and trackbacks are currently closed. Very good, very very good. I am from Brasil and dont speak englis, but I love yours articles.